Jazz Band London. Vintage Jazz. Speakeasy Jazz Band Hire or Prohibition Jazz Band Hire it’s all the same thing, (also think 1920’s Jazz Band, Trad Jazz Band, Roaring 20’s Bands, Dixieland Jazz Band and Great Gatsby Jazz Band) We present the London based Mississippi Swamp Dogs Jazz Band. Often known by their alter-ego “Dan Darling and his Lovely Chaps” they’ve been brought up from the Deep South to perform a stunning mix of Vintage Jazz Standards to get the toes tapping, the legs shimmying and the arms sailing!! With members of the band “borrowed” from the top “Period Orchestras” on the London Vintage Circuit, you’re guaranteed a tip top event. The band is perfect for a Charity Ball, a Roaring Twenties Night, a Great Gatsby night, a Jazz Club, a Wedding Reception and Wedding party. Not only the above. 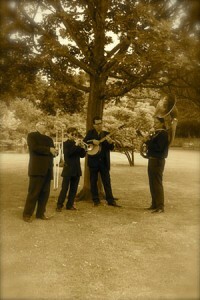 The band is so suitable for corporate events like Henley, Ascot and Wimbledon. The band also do Company Promotions, Thames cruises and even funeral celebrations! For more information here is our contact page. 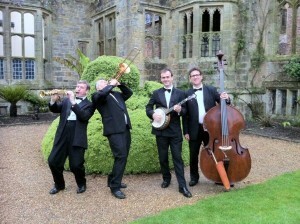 You can also go to our Jazz Band Hire page for phone numbers and email. Maybe you want to see the band play in London? Access our public performance dates here. The following services are also offered: Great Gatsby Jazz Band Hire, Speakeasy Jazz Band Hire, 1920’s jazz band Hire London, Dixieland Jazz Band Hire, Jazz band hire Kent, Jazz band hire Brighton, Jazz Band Hire Oxford, Jazz band Henley, New Orleans Jazz Band hire, New Orleans Funeral Jazz Band hire, Burlesque Band hire, Jazz Band Wedding Hire, Cruise ship band hire, Chelsea and Hampton Court flower show Jazz Band, Party Band Hire, Jazz Band Hire Cotswolds, Jazz Band Surrey Hire too. Want to know something of the Prohibition era? Read some information here.